I am so excited to get started on decorating for Halloween! This has been one of my favorite holidays, and so I get really hyped when it comes around each year. For this round, I decided to see how much I could create from reusing old products like cereals boxes and such I use in the kitchen. 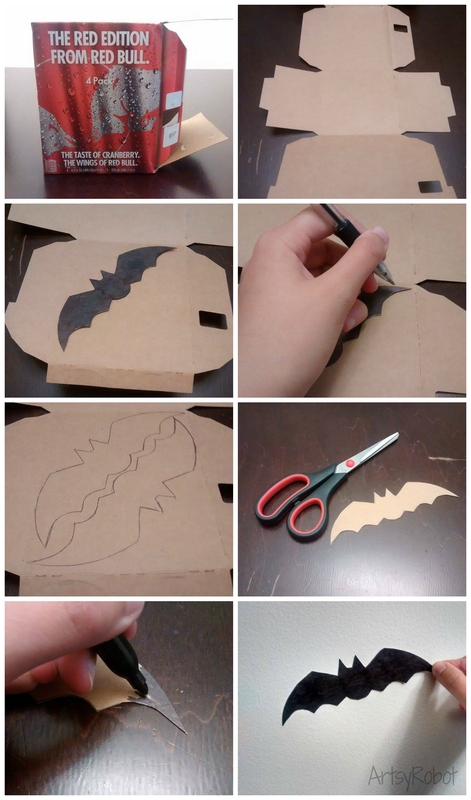 The first project that I completed was some bats I created from Redbull and Veggie Burger boxes. Below is how I made them! I disassembled the boxes so they were flat and drew a bat on it with my pen based off a bat I had created earlier. After cutting out the bat, I colored it with a sharpie. When I created enough bats, I taped them to the wall. If you would like, I could create a printable as a reference if you would like to create some of your own bats! I’ve never made one before, but I’m game to try to make one. If you are interested, or have any other thoughts or ideas from this little project, comment below! Thank you for reading! Hope you have a great weekend! P.S.S. I made my first pinterest pin for this craft! It looks like the rest of the fancy stuff you see on there, so I’m really excited about it!